Ants and general pests can be, well…pests! 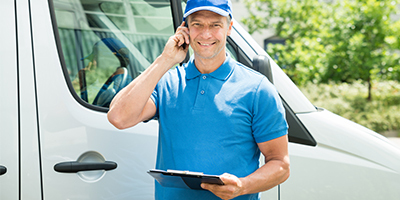 Our pest removal technicians have been serving Southern California for over 20 years and are experts at getting rid of all those little bugs. During hotter weather, ants and bugs tend to look for shelter, food, and water in your home, even without your approval. Because of the sheer number of ants and bugs near homes and businesses, we strongly recommend taking advantage of our monthly pest control program. The initial service will create a barrier around your home to keep the bugs out, and every month your technician will visit your home to reinforce the barrier created on the initial visit. Bugs already inside? No problem! Our trained technicians can take care of the problem no matter how bad. Interior treatment pricing is based on square footage, so to find out more, call us today! The best way to defeat bugs inside and outside of the home or business is through on-going pest control. 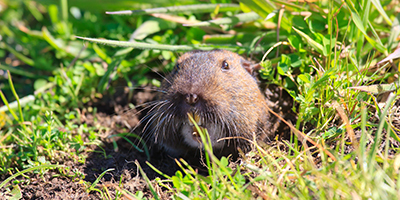 Call Gopher Patrol, Southern California’s Top Rated Local® pest exterminator to schedule an appointment and put an end to your pest control problems. Ants are eusocial insects of the family Formicidae and, along with the related families of wasps and bees, belong to the order Hymenoptera. They are a diverse group of more than 12,000 species, with a higher diversity in the tropics. They are known for their highly organized colonies and nests, which sometimes consist of millions of individuals. Individuals are divided into sub-fertile, and more commonly sterile, females (“workers”), fertile males (“drones”), and fertile females (“queens”). Colonies can occupy and use a wide area of land to support themselves. Ant colonies are sometimes described as super organisms because the colony appears to operate as a single entity. The head of an ant has many important parts. Ant eyes include the compound eyes, similar to fly eyes: numerous tiny lenses attached together which enables them to see movement very well. They also have three small ocelli on the top of the head, which detect light and dark. Most ants have poor to mediocre eyesight; some are blind altogether. A few have exceptional vision though, such as Australia’s bulldog ant. 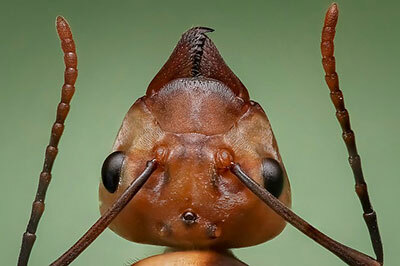 Also attached to the head of an ant are two antennae (“feelers”). The antennae are special organs that help ants detect chemicals, including those used in communication, as well as a sense of touch. Ants release pheromones to communicate with each other and the antennae pick up these chemical signals. The head also has two strong jaws, the mandibles, which are used to carry food, manipulate objects, construct nests, and for defense. In some species there is also a small pocket inside the mouth to hold food for passing to others.